Link: The Group was formed first to work with the Second British Army and in 1944 worked with the First Canadian Army. 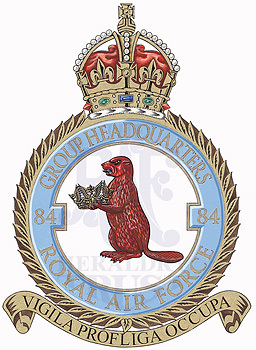 As the HQ was formed at Oxford, a beaver has been adopted as part of the badge being one of the supporters of the Arms of that City and is coloured red to indicate its association with the Army. The Astral Crown commemorates success in the invasion of the Continent. Motto: Latin: Vigila Profliga Occupa – Keep watch, strike down, take possession. History: Formed as No. 84 (Composite) Group at Cowley Barracks, Oxford on 15 July 1943 and disbanded at the Brandenburg Barracks, Celle, Germany on 15 December 1947.